Peaches and Paprika: CAT-Tails TV show coordinated by Carol: taping today! CAT-Tails TV show coordinated by Carol: taping today! Thought you might be interested in what our human, Carol is up to. This is a collage she made to illustrate all the nifty guests on a 6-segment TV show she is Coordinating. The name of it is CAT-TAILS. Her co-creator, Connie Galli is doing the interviews, and Carol coordinated most of the guests! Yesterday we taped two CAT REIKI professionals (it was nifty!) 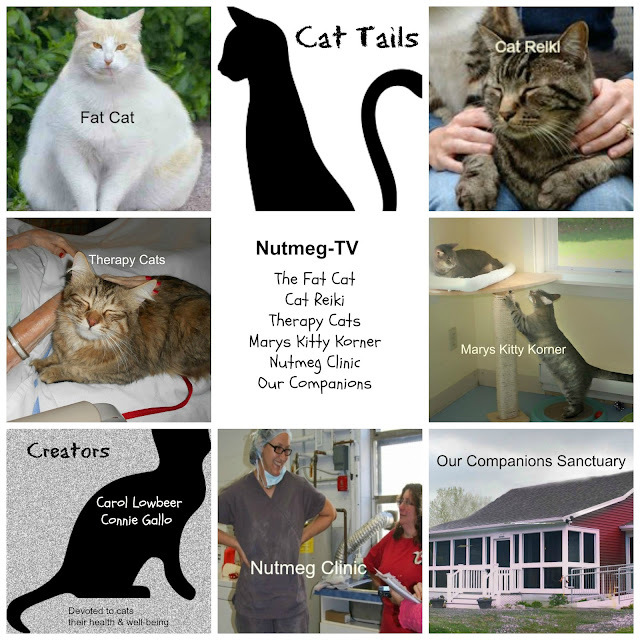 And a real live vet from a popular practice here in Connecticut talking about the FAT CAT. And TODAY there are TWO THERAPY CATS arriving for this afternoon's taping. And they will be bringing their owners. The 2nd guest is a well known animal shelter here in CT, Marys Kitty Korner, the previous home of....US!!!!! We'll post pictures tomorrow of the taping. What a cool thing for your mom to be working on. We can't wait to hear about the therapy kitties. Wow, that is terrific about Mom Carol. Is there anyway we can see this on TV or at least get a DVD of it. That looks terrific. We do want to hear more about this. Take care. We cana't wait to hear more about it! Is there a link to see the show? That sounds like a great show. This is furry exciting! What a great thing for your human to do! What a cool thing fer a Bein ta be doin!